Safety - 3J Fuel Carriers Inc.
We take safety very seriously at 3J Fuel Carriers following Department of Transportation standards. We go beyond the standards to make sure our drivers and customers are protected. Knowing injuries occur in our line of business, we take the initiative to do what it takes to be safe. Our consistent focus on safety requires us to constantly gather information about the hazards we face on a day-to-day basis. With our committed team, we address these hazards and train our staff, both in house and through third party classes, to manage the risk accordingly. As part of our safety program, all of our employees are trained and educated on safety precautions. 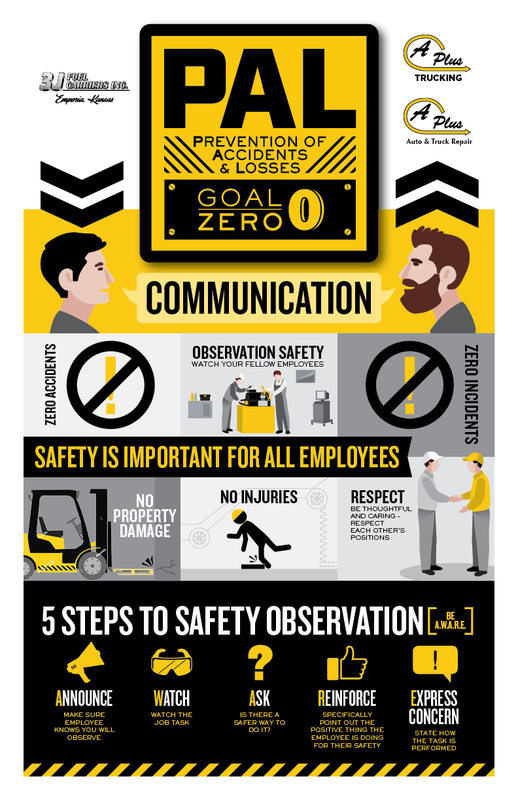 Our Prevention of Accidents & Losses (PAL) is Goal Zero. We display these posters throughout our facilities reminder our drivers and staff to observe their surroundings. It’s important that EVERYONE of our employees gets home safely to their families.